Screen printing is the most common type of printing and when printed with plastisol inks, it will last the longest! It is the most affordable option when it comes to the printing industry, when printing larger orders. It can also be inexpensive for smaller orders when run with fewer colors. Screen printing is a printing process using a stencil made of emulsion to run ink through a mesh screen to imprint the design onto the clothing. Screen printing is priced on several different key factors. The location, and how many spots are being printed, the color of the garment, color of printing, and the amount of prints. 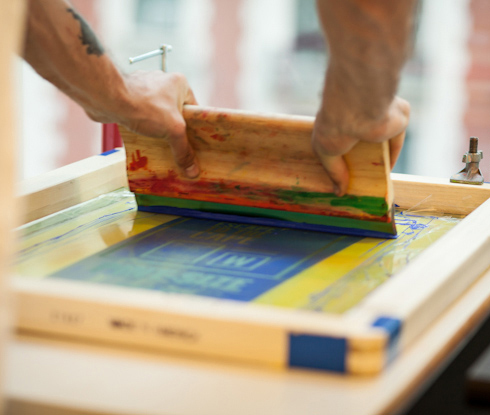 Screen printing requires a screen for each color in the art and may not be cost effective for multiple colored prints on orders less than 24. The more shirts ordered, the overall cost is then distributed making the final price cheaper per shirt. Call, email us, or stop by!